It was raining. That's what started it. I'd driven back to the church after a whirlwind tour of area nursing facilities, having checked in with parishioners in various states of recovery from various things. One had been asleep. Another wasn't in his room. You never really know what state you'll find them in when you arrive, really. This was somewhat to be expected. Still, it had been a lot of driving, and the afternoon was beginning to wind down. I half-slumped into my chair to take a breather before finishing up whatever I needed to do and heading home. And then it thundered. And then it started to rain. Rain seems to have a different feel to it depending on the time of year. Autumn rain helps release the smell of leaves that have fallen. Spring rain has a life-giving feel to it as flowers and trees bud and bloom. As for summer rain, it seems to wrap you in a blanket, the warmth of days mixing with the damp of humidity to create something that invites you to become enfolded in it. With that invitation, I didn't want to sit in my office. I watched it from my window for a few minutes, but the pull to wander through the building was stronger. Eventually I ended up at the door to the education wing. Outside is a wraparound awning and carport, with a separate set of doors to the narthex. I couldn't tell you why, but I just wanted to stand under it. For lack of a porch, this would have to do. So out I stepped, sheltered from the drops yet able to observe, to listen. And I just...watched. 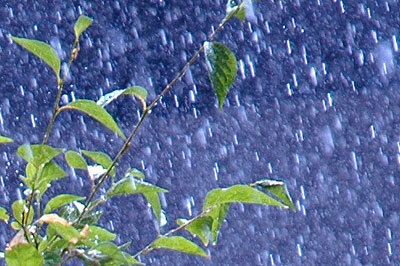 I leaned against the wall and I watched, the shower thick enough to be noticed but not a hard downpour. I took in my surroundings. I thought about this place where I've now been ministering for nearly six months already, and my first interview with their search committee which took place a year ago this week. I thought about its similarities to the church where I'd been confirmed and which helped me figure out that this is what I wanted to do. I thought about the in-between: lessons learned sometimes in painful ways, and certain things from which I'm still healing. But then I didn't want to think about any of that. I pulled myself back because for a while I just wanted to think about the rain. I just wanted to savor and feel its soothing effects on my spirit. I thought about it for a little while longer, and then figured it was time to go back inside. The workday was nearing its end, as August is, a little at a time.